London, 1955: Grace Monroe is a fortunate young woman. Despite her sheltered upbringing in Oxford, her recent marriage has thrust her into the heart of London’s most refined and ambitious social circles. However, playing the role of the sophisticated socialite her husband would like her to be doesn’t come easily to her—and perhaps never will. Then one evening a letter arrives from France that will change everything. Grace has received an inheritance. There’s only one problem: she has never heard of her benefactor, the mysterious Eva d’Orsey. So begins a journey that takes Grace to Paris in search of Eva. There, in a long-abandoned perfume shop on the Left Bank, she discovers the seductive world of perfumers and their muses, and a surprising, complex love story. Told by invoking the three distinctive perfumes she inspired, Eva d’Orsey’s story weaves through the decades, from 1920s New York to Monte Carlo, Paris, and London. But these three perfumes hold secrets. And as Eva’s past and Grace’s future intersect, Grace realizes she must choose between the life she thinks she should live and the person she is truly meant to be. 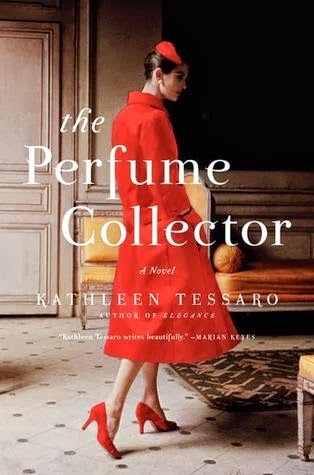 Illuminating the lives and challenging times of two fascinating women,The Perfume Collector weaves a haunting, imaginative, and beautifully written tale filled with passion and possibility, heartbreak and hope. I am in the middle of this book and I am LOVING it! Cannot wait to get back to it. So glad She Reads Book Club chose this for the August selection! We are heading out for a mini vacation to Lake Placid, so I am hoping to get some reading in. Five hours in the car= plenty of reading time!! I will be packing light, so I plan to load darling daughter’s kindle up with a few good ones. I will have The Savage Garden and In the House Upon the Dirt Between the Lake and the Woods. In between bike riding, kayaking, and general fun having, I got some good reads to look forward to!